So with the “state” of the economy, and all the drum and glum you hear/read about these days, and everyone says it is a buyer’s market, someone must of forgotten to tell the sellers! We’re having a hell of a time trying to come up with something in Parker Colorado that fits into what we want. We’ve now made 7 offers on 4 different houses, and we’re aren’t any closer than when we started. 2 of those 4 houses are short sales, one we actually still have a pending offer hanging out there, and the other we are likely to bid on again as our 8th offer we’re about to make will be the third on the particular house, and I don’t think the seller is going to come down in price where we want. So far the buyer has only come down in price by $2k, and based on our request for the hot tub, washer, dryer, they cut the closing concessions by half. This next offer, which we’ll sign in the morning, will be the last offer we make on this house. We’ll see how the seller comes back. Needless to say we are getting very frustrated with this process! We would like to move, but we really don’t want to settle on a house we won’t be happy with. So we heard back on our offer, they countered with 97% of the asking price, taking into account the closing costs we asked to cover but leaving out the hot tub, washer and dryer we asked to be included. We offered 89% with $6k in closing costs, and the washer/dryer/hot tub. So now what? I think we raise our offer by $10k and continue to ask for the washer/dryer/hot tub. If they counter again we might go up a bit, but we’ll raise the closing costs. I hate house shopping! I just want it to be over so we can get our move on. So yesterday we put in another house offer in Parker Colorado. This time for a more reasonably priced house, with the offer being around 89% of their asking price. I’m not sure if they’ll accept, counter, or just ignore us like the last offer. We’re anxious to find out. If they were to accept it that will put our closing date on 6/30, which once you start to think about it is just right around the corner! yikes. I’ll post an update when we hear about the offer. Well it looks like we're going to start our house search over again. 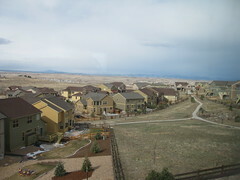 The bank came back and rejected our offer on the short sale in Parker, Colorado. So now we need to plan another trip or two out to Parker to look at other houses. From the previous two trips the house we offered on was the only "one" we just had to have. Hopefully we'll find another "one" for us! So earlier this week I heard from our Realtor in Colorado. He said the owner had accepted our second offer on the house and had passed it on to the bank for their review. Supposedly the seller’s realtor said he hopes to hear back in 7-10 days from the bank. I don’t know if I believe that or not, we’re not getting our hopes up. It would be nice to know soon, but only if we get it! At least if the bank turns us down we will know and can start looking for other options. With as busy as things have been since we were last in Parker we haven’t looked at other houses. I did get a scare last night. I checked my voicemails for a new message and the message came across with a fax shrill, so I hung up and checked again. Well the first message it played was the voicemail from our agent from last week telling us that the owner had turned our first offer on the house down. I wasn’t sure that it was an old voicemail, I thought it was from last night, so I called David up and asked him if he had called. Fortunately he hadn’t, it was in fact last week’s message. So I immediately went and deleted the voicemail, no more mistaking that damn message for a new one! I’ll post another update when we hear more! So today Natalie and I signed our first home offer on a house here in Parker Colorado. It’s a beautiful house, on top of a nice hill, great view of the mountains, and a nice park area out back. It’s a short sale, so we’re anxious to see how it all turns out. We aren’t expecting to hear much anytime soon on it. Of course we would love to, but I imagine it will take a while, fortunately for us we aren’t rushed in our move. We also looked around at a number of ranch homes today. We found one yesterday that would be great except the garage isn’t big enough for 3 cars, even though it was listed as a 3 car. Some of the ones today are definitely interesting, but we’re hoping that this one we made an offer on is the house for us. We’re flying back to St. Louis in the morning, so I’ll keep this short.